Perhaps it was the start of school or the bins of apples at Whole Foods or that the butcher didn’t have any pork tenderloins available for me to grill, but I picked up boneless pork chops for the first time in forever. 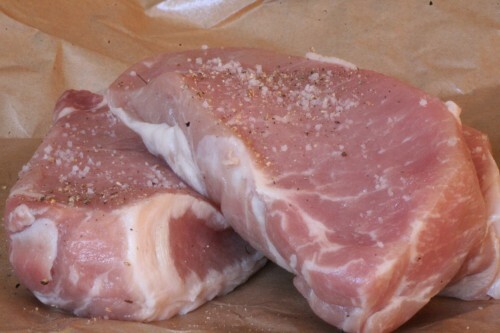 Pork chops, although a meat and that means cholesterol, are not criminal when you go lean, cut-off the fat and stick to a 4 oz portion – about 200 calories and 1/4 of the daily cholesterol allowance. My mom used to bake massive bone-in pork chops and, as if we wouldn’t have been satisfied with the brontosaurus portion of meat, she stuccoed on a thick milk-to-flour-to-egg-to-breadcrumb coating. It was delicious and barbaric. I would wrestle that meat off the bone like a grisly mountain man devouring his critter meal.And the worse part, or the best part, depending on your relationship with fat, was the crispy fatty edge that I would ration out to every bite of the dried-out meat. I used to spread butter onto steak too, but that’s for another time. Ready, clear! and…we gotta a heartbeat. All those fat-laced, processed cheese, sugar-coated days growing up in Wisconsin that brought me to eating real food. 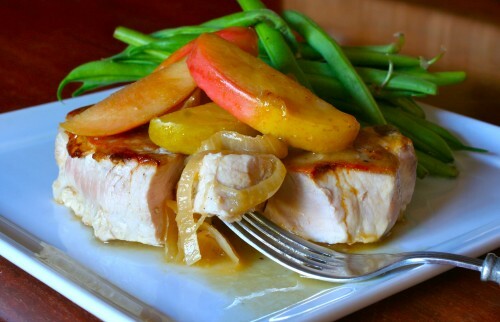 I would need to have healthier way to eat pork chops. I caught Lucinda Scala on the Today Show. Here is the part as a mom where I feel the need to justify any television viewing: it was 5:45 am before anyone awakened and I breezed through the show at 4x speed,(east coast feed on west coast DirecTV) stopping only to watch critical news stories and pork chop talk. Lucinda is known for making hearty meals for her man brood at home. 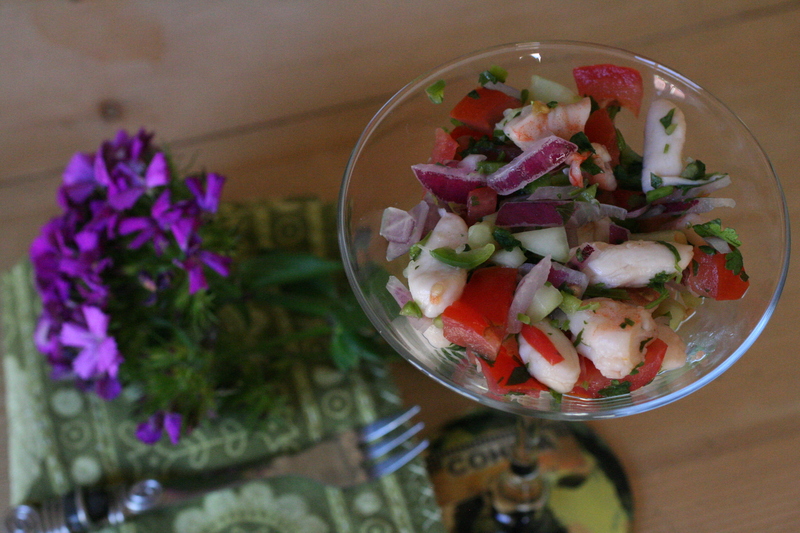 This recipe seemed harmless and fast – perfect for crunchtime. I modified it and we indulged. 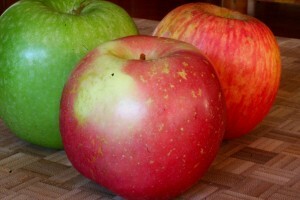 Reminiscent of pork chops and apple sauce,can you hear Humphrey Bogart now?, but this preparationkeeps the apples in tact, holding on to their nutrients and offering a make-ahead option. Let’s not dismiss the onions here either and their cardiovascular and anti-inflammatory benefits. Cut away excess fat from the pork chops. Heat olive oil in large pan over medium-high heat. 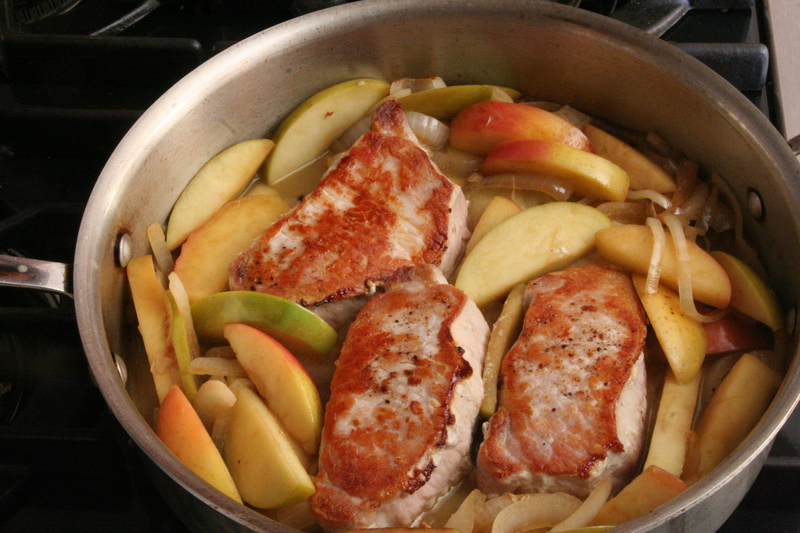 Make sure the pan is large enough to accommodate the chops and apples and onion mixture. Brown the chops about 5 minutes on each side, remove and set aside. 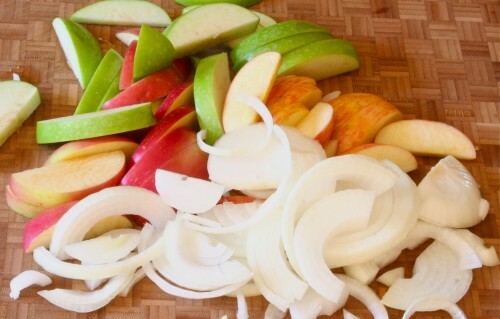 Melt butter in the pan and add in the onions and apples. 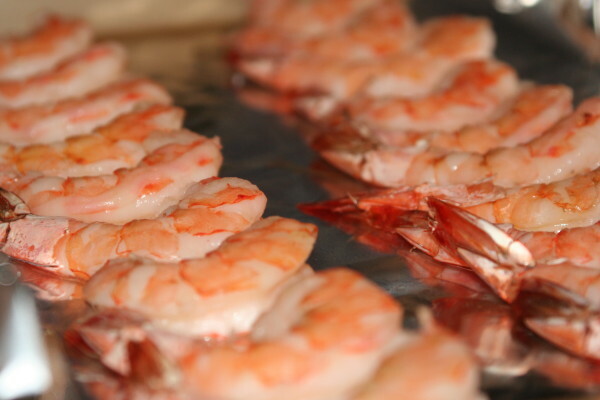 Cook for about 8 minutes, stirring occasionally until they begin to caramelize. Pour in the broth and maple syrup and stir. 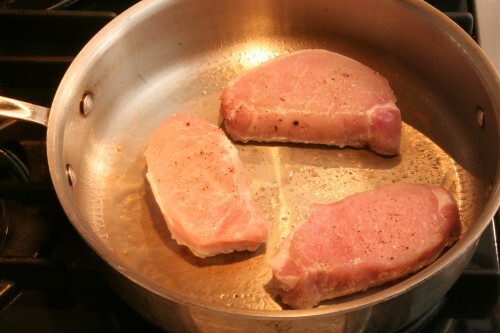 Place the pork chops back into the pan and cook over medium heat for about 15 minutes. Crispy Sage: Heat 1 T. olive oil in small pan over medium heat. Add 10-12 fresh sage leaves to the hot oil and fry, turning once. Drain on a paper towel. 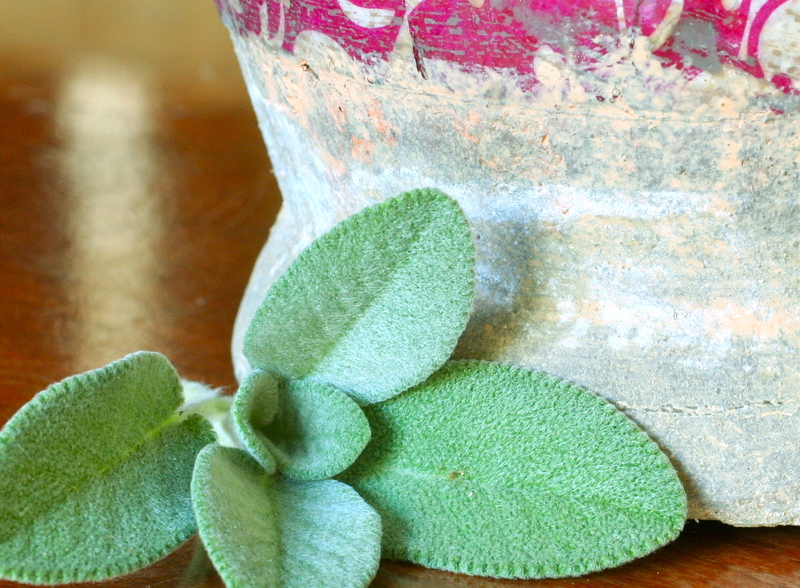 Cook’s Options: Add 1 t. dried sage leaves when adding the chicken broth. 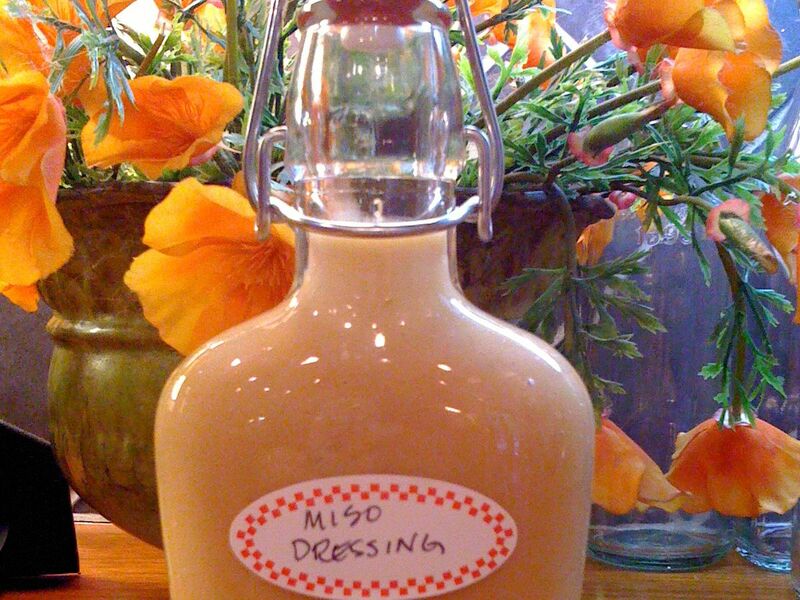 Instead of broth use: beer, white wine, or apple cider. Do-ahead Option: Make the entire dinner to the point of placing the chops back into the pan with the cooked apples and onions. To do so, turn off the heat and let the mixture cool and then put into the refrigerator until 30 minutes before you serve dinner. 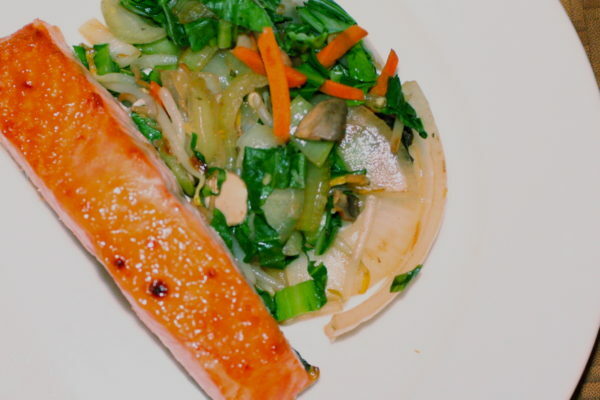 Cook for 15 minutes over medium heat and serve with vegetables.